Hello 2012!! So so so glad last year is behind me and officially over! GAH!! 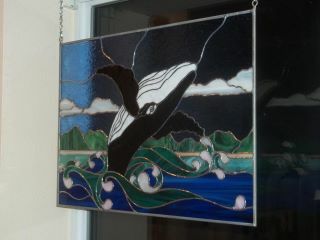 Xmas gifts fo glass made their way safely home to their new caretakers and have been hung with care. I find that I really enjoy seeing the pics of the art up in their permanent locations. Keep them coming. Update on the Saga of the soldering iron. I can’t remember what i posted here, so I’ll do a quick recap. Soldering iron temp was fluctuating wildly. ordered new tips; they were absolutely not the correct ones. Finally located a dealer for hakko in the US. Wonderful customer service (for the quality of the service, alone, I would recommend them). Sent the iron and regulator unit off for a check up. Turns out that it was the tip. The repair order said the tips and housing were “heavily oxidized”. so I called them up to ok the repair and pay for it (complete new tip, ceramic core and house $24) and ask what I could do to further extend the life of the tip. The iron is almost 6 years old. When I told the service rep the age, she laughed and said, oh, you got your monies worth out of that tip. Which is good to know. so kids, clean your tip, keep it “wet”, use your sal amoniac block, and when you get a crusty build up, use a soft wire bristle brush to gently clean the debris from the barrel. I have decided to move the glass workshop out of my back bedroom, to the Dining room. I do not dine in the dining room. And it takes too long for the heat to get to the back of the house. I have sold my dining table and chairs, and will begin the move next weekend. The back bedroom has never felt completely right. I’ve been in it for 6 months, plenty of time to acclimate, but still no go. Once I get it moved, I’ll be starting one more underwater scene. I have some good ideas and am excited to get going on it. I have put up the pattern for Lord Ganesha on Etsy.com, you can see it here. I will be adding other patterns as I make them. 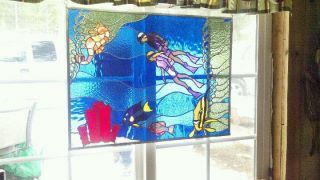 The original “divers” pattern will go up, the one with the light rays. I might watercolor that, since I don’t have a finished piece in that arrangement. Having fun with it, and that is what it supposed to be all about, right? I think that is it. I am putting off getting ready for the day. I suppose I should get to it. Happy New Year! ~ by kellig on January 6, 2012.